Mpow Dog Car Seat Cover Just $17.99! Down From $46! You are here: Home / Great Deals / Amazon Deals / Mpow Dog Car Seat Cover Just $17.99! Down From $46! Here’s another deal you can get at Amazon! Score this Mpow Dog Car Seat Cover for only $17.99 down from $45.99 PLUS FREE shipping with Amazon Prime or for orders over $25! This dog car hammock is made of 600D Oxford fabric materials that are 100% waterproof and can protect your car seat from pet hair, mud and water. The nonslip soft rubber backing and multiple secure straps keep the pet seat cover in place even on leather seats. The premium heavy-duty, durable and steady material prevents damage from claws, dirt, wet dogs, water, sand, mud, accidents and slobber. The high-quality pets seat cover is quilted for a classy look and feels that will blend seamlessly with your vehicle’s interior. Just feel the difference of our cover’s high-end signature material in your hands when compared to others. PREMIUM DURABLE MATERIALS: With 4-layers of protection, 600D Oxford fabric, comfy cotton, anti-slip bottom, heavy-duty waterproof middle, MPOW PET SEAT COVER is anti-scratch, durable and sturdy, ideal for leather seats. WIDER COVERAGE & NON-SLIP BACKING: Thanks to the anti-slip backing, once installed and no matter how active your pet is, this DOG CAR SEAT COVER leaves ample room for moving around and helps your pets stay in place cozily. Comfy cotton keeps your puppy a good sense of comfort during transportation. WATERPROOF & EASY TO CLEAN: This hammock covers the entire seat for perfect protection from whatever mess pets cause and thick enough to against dog’s nails and wet paws, also a great protector for seats from dogs’ dirt and hair, designed for dog owners. Made with heavy-duty waterproof polyester, easy to clean with a damp cloth or just vacuum. 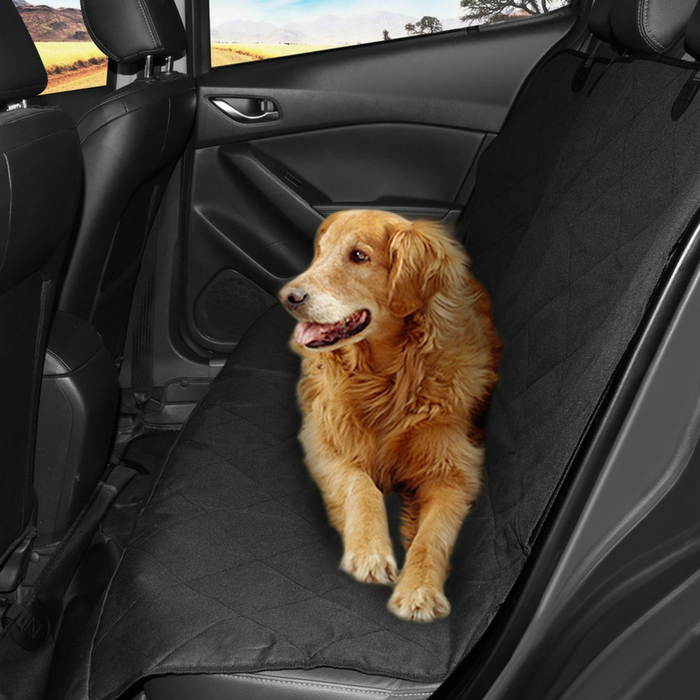 UNIVERSAL DESIGN: This large 54″” X 58″” waterproof DOG SEAT COVER fits most cars trucks and SUVs’ rear seats, as either a hammock or bench seat cover. EASY INSTALLATION: Our hammock waterproof bench seat cover is very convenient to install with quick release clips. Just secure it in place using the two clip-together seat anchors and the four adjustable headrest loops. Two Velcro openings allow for accessing the seatbelt buckles. In less than a minute you’ll have it fastened in place and ready to go.